As a public or private residential community, you have a responsibility to create safe facilities for your residents. When it comes time to plan for new flooring or renovating an existing athletic space, many request the advice of an experienced athletic sports complex builder like Dynamic Sports Construction, Inc. before starting any projects. Our experts will never tell you to undertake a project that is simply unaffordable or overambitious for your community. After all, your goal is to provide a community benefit that will be used and worth your investment. We work with all types of facilities from places of worship and educational campuses to recreation centers. Almost every one of these has one thing in common: basketball courts. When you contact our experts to schedule a consultation, we will assess your needs and ask about your court space. In many of these situations, resurfacing existing indoor courts for basketball, volleyball, and pickleball are usually the most affordable and impactful investment for the community. After all, indoor basketball courts are incredibly versatile for all ages and sports skill levels. Dynamic Sports Construction has exclusive basketball court flooring options to help keep your price points low and provide long-lasting surfaces for your community. DynaCourt® – This is a solid PVC court flooring system that is pre-manufactured and engineered for multi-purpose gym floors. It’s a dimensionally-stable floor system that offers great shock absorption and noise reduction that is necessary for indoor facilities. DynaForce® – This is our hybrid system that combines sheet and poured systems for greater tensile strength, safety, and flexibility for an indoor court. It’s entirely customizable to your facility’s needs and can help you earn six or more LEED points for green building certification. Most of the U.S. has temperamental winters with rain, snow, and otherwise bitter outdoor temperatures. An indoor basketball, volleyball, or pickleball court is a worthy investment for these areas because it provides an alternative for the community to stay active, even in the off-season. Combats the winter fatigue – because an indoor basketball court is a space that is easily convertible to play other sports, such as volleyball and pickleball, it gives everyone an option to exercise year-round. Continued momentum – The off-season is when most risk losing their progress, so an indoor court gives aspiring athletes the opportunity to develop better muscle memory through fitness training. When applicable, it also is a space to improve basketball skills and agility. Improved safety and less risk of injury – Practicing indoors during the colder months is safer than on outdoor courts. Athletes endure fewer slip and fall incidents where standing water, ice, and other outdoor weather elements are a risk. Some may think it’s counterproductive to have both an outdoor and indoor court. This is not true! In fact, it’s complimentary to have an indoor basketball court on-site for more reasons than the colder season. 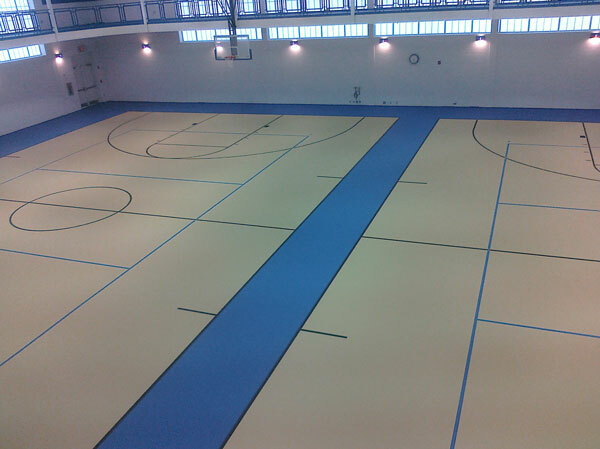 Updating or installing new basketball court flooring is a worthy investment for your community. The surfaces are versatile for all ages and can provide the most benefit for multi-purpose uses. If you’re ready to start a conversation with our experts about your next steps, ! Dynamic Sports Construction, Inc. is one of the nation’s premier basketball court builders and flooring installers and has been since 2004. We have the experience necessary to give your facility the boost it needs to generate community use, giving you a lasting return on investment.